Happy St. Patrick’s Day Twin Cities! No matter what “Thing To Do” you will be doing this Thursday evening, be sure to be responsible and get home safely! 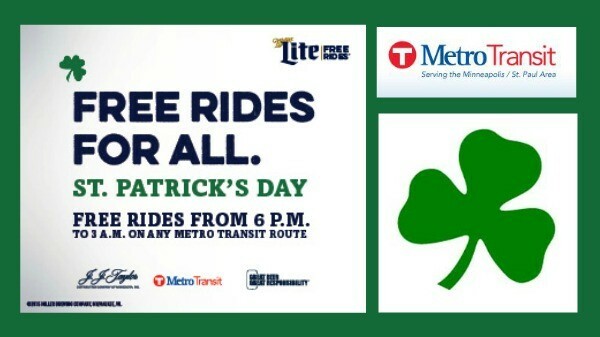 Once again, Miller Lite has teamed up with the Metro Transit to offer free rides on all Twin Cities Metro Transit buses and light-rail routes from 6:00 pm until 3:00 am. For more details, here is the official press release! MINNEAPOLIS/ST. PAUL (March 10, 2016) – The Original Lite Beer is once again celebrating St. Patrick’s Day in the Twin Cities by providing residents and visitors with the popular Miller Lite Free Rides® program. In partnership with Metro Transit and J.J. Taylor Distributing, Miller Lite will provide Free Rides Thursday, March 17 on all Metro Transit bus and light-rail routes, as well as the Northstar commuter train beginning at 6 p.m. until 3 a.m.
“We’re proud to provide Miller Lite Free Rides in the Twin Cities for the 20th year, and encourage everyone out celebrating to take advantage of this free and convenient program.” said Diane Wagner, MillerCoors responsibility commerce manager. “With great beer comes great responsibility, and that begins with planning ahead for a safe ride home, which we’re offering for free,” said Diane Wagner, MillerCoors responsibility commerce manager. The Miller Lite Free Rides® program is celebrating its 28th anniversary this year. Since the program’s inception, Miller Lite has provided more than 4 million ‘Free Rides’ in a total of 16 communities across the country, and has gained the involvement and support of local law enforcement, public safety agencies, and other community and government organizations nationwide. For detailed route and schedule information, visit MillerLiteFreeRides.com, call 1-800-FREE-RIDES (1-800-373-3743), or text “METRO” to 90464. 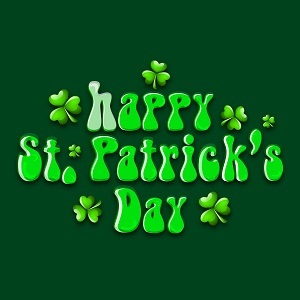 Have a safe and fun St. Patrick’s Day tonight!